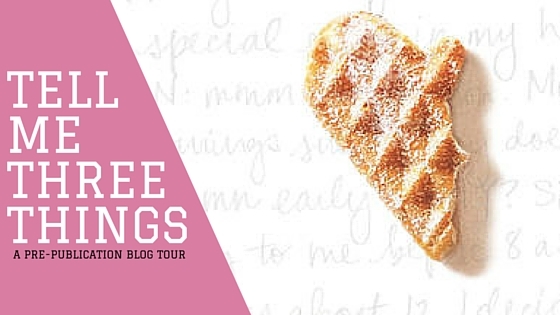 I'm so, so, so thrilled to be a part of the pre-publication blog tour for Tell Me Three Things. I read this one last month, and fell head over heels in love with Julie Buxbaum's writing. My review will be up closer to the book's actual publication date next year, but all you need to know is that I really, really liked this one! You'll get a glimpse of how I felt when I share three reactions to this novel today, in addition to three fun facts about Julie and her book. Plus, stay tuned for an ARC giveaway at the end of the post! 1. Jessie faces a lot of typical teen challenges (growing up, part time jobs, doing well in school, romance and friendship and family dynamics), and Julie Buxbaum portrays those realistically. 2. Tell Me Three Things has a wonderful online aspect to it, and it really made me think about how I've been just as lucky as Jessie in that my online relationships have translated to real friendships. 3. I love the fact that this story reads just like a romantic comedy. 1. The book was inspired by an anonymous email I once received from a law school classmate. 2. Tell Me Three Things was mostly written in a noisy coffee shop with a terrifying bathroom. 3. The book was originally titled Somebody Nobody, but then one day in the shower (pretty late in the publication process), it hit me that it should instead be called Tell Me Three Things. I'm so happy I changed it. 1. Before becoming a novelist, I was a lawyer. Loved law school, but truly hated the practice of law. So boring and tedious and you have to stick to the facts. Ugh. It's so much more fun now to make stuff up for a living! 2. Since graduating law school, I have moved to New York, LA, London, back to NY, and then back to LA again. 3. I don't like to shop for myself, but I spend way too much time and money on curating and buying books for my kids. It's kind of a problem. Before we get to the giveaway, here's a little more information about Tell Me Three Things! The thing is, Jessie does need help. It’s been barely two years since her mother’s death, and because her father eloped with a woman he met online, Jessie has been forced to move across the country to live with her stepmonster and her pretentious teenage son. In a leap of faith—or an act of complete desperation—Jessie begins to rely on SN, and SN quickly becomes her lifeline and closest ally. Jessie can’t help wanting to meet SN in person. But are some mysteries better left unsolved? And now, it's time for the giveaway! 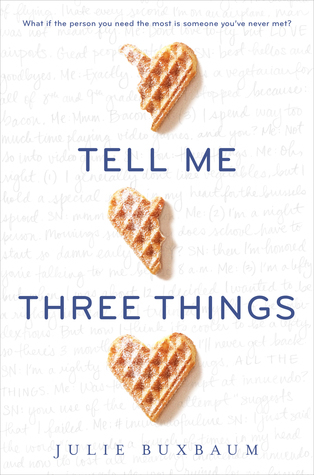 Enter to win my ARC of Tell Me Three Things via the Rafflecopter form below. Please note that this giveaway is US ONLY, and winner will be picked on 12/28. Good luck, friends! You certainly should enter to win this one. You can earn $20 for completing a 20 minute survey! Guess what? This is exactly what big companies are paying me for. They need to know what their customer base needs and wants. So large companies pay millions of dollars per month to the average person. In return, the average person, like me, fills out surveys and gives them their opinion.